When you see the little Haagen-Dazs cups sitting next to the neat little Ben & Jerry's cups, what do you think about? You think about which flavor you want right? I never would have made my decision based on snackical engineering, but after tonight, I think I would. While my little cup of Ben & Jerry's was a fun five minute break, my HD time was an exercise in sticky fingered futility. That little golden spoon became the bane of my existence for approximately 217 seconds as I messily tried to dig into the hard HD. There is a slight ring around the spoon, but it doesn't have that nice sharp edge that the B&J spoon had. To complicate things, the outer layer of ice cream was melting and causing the entire little ball of ice cream to spin inside the container as I tried to dig in. I was forced to eat the melting part first since it was easier to scoop, but with each crumbly attempt, my fingers got a little messier. Funny how the hard nature of the HD has backfired in making a tiny treat like this. So, it's not that this is a bad ice cream, i just don't think it's a good application of an ice cream. Sure, I could have grabbed a spoon from the drawer, but you can't do that when you're running back to the office or wherever else you may have to go. Just so you know, I had picked this up because I was wondering if I would prefer it over HD's Vanilla Five. Five is definitely a bolder flavor, and a bit healthier, but if I had to pick, I'd probably go with the ....ok, you'll have to make your own decision on this one. On Second Scoop: I was so worried about the comparing flavors, that I forgot a much more obvious comparison. After finishing off this little container I remembered something: The Vanilla Five is way creamier. The regular vanilla is nice, but it's very heavy and thick. I mean, it's suppose to be, but having experienced the ultimate creaminess of the Vanilla Five, it's hard to go back to the regular Vanilla. 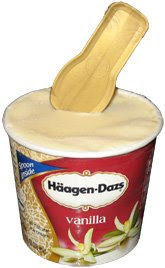 Final Scoop (2012): Just for a little clarity, I want to say that a fresh pint of Haagen-Dazs vanilla ice cream is excellent. Nice flavor and texture, the post above was merely commenting on the infuriating spoon. The ice cream is wonderful and I can down half a pint without even thinking about it. You just can't beat a nice relaxing vanilla. Nice job. These little cups seem to be the hot new thing. The Raleys here has minis of Haagen Dazs, B&Js, Breyers, a gelatto company and now even mini Starbucks ice cream. I love them, great portion control and a nice way to try out new flavors. Breyers and Starbucks too? COOL! Besides H-D and B&J, I've only seen Edy's.